On March 1, 1984, Our Lady began giving, every Thursday evening, a weekly message for the parish of Medjugorje. It was Marija through whom Our Lady entrusted these messages for the parish. Through these messages, Our Lady desired to spiritually form the parish because of the special role it would play in helping to bring conversion to all the people who would come to Medjugorje from all over the world. Eventually, this weekly message evolved into the monthly message for the world, given on the 25th of each month. It was January 25, 1987, when the first monthly message was given from Our Lady. Marija is the only visionary who receives the 25th message. It stays within her memory only until she writes it down. After it is written, she no longer can repeat the message word for word. Marija has said that satan causes “great confusion” in her life on the 25th of each month. He strikes back at the one who delivers Our Lady’s healing words to a sick world. This gives evidence that Our Lady’s words each month are causing havoc to satan’s evil designs for the world. 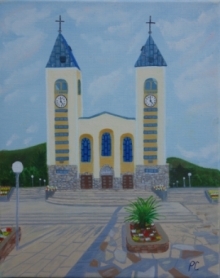 As Our Lady began to initiate the parish of Medjugorje into an intense spiritual life through the young visionaries, Marija began to feel the pull to the religious life. She, with Ivan, under the direction of Our Lady, began a prayer group of young people, and through the years Our Lady led them towards a profound love of Jesus and the Holy Mass. It was the decision of Marija to enter a religious order, but as she began to look at possible orders to join, she began to realize that to accept the Rule of the orders meant she would lose the freedom to openly witness to the apparitions and spread Our Lady’s messages. In her heart, there was no question of what her responsibility was in regards to being a chosen witness of the apparitions in Medjugorje. She could not join a religious order if it meant having to stop spreading the messages of Our Lady. Also, as Our Lady’s plan became clearer to the visionaries, they began to understand that vocations to the religious life were best filled by those who were raised in holy families. With holy families there will never be a lack of good and plentiful vocations. Our Lady also spoke in Her messages about returning to the beginnings, or the foundations. John Paul II said that if a religious order is languishing and needs to be restored, the members should return to the order’s founding. All vocations materialize from the family, which is the “foundation.” Good, solid families birth good, solid vocations. The crisis of so many wrecked vocations can generally be traced back to disordered and dysfunctional family life or no family life at all. With Our Lady’s guidance, it was at that point that Marija became opened to marriage for the first time. She eventually did marry a young man from Milano, Italy, who had been a good friend of hers for approximately five years. Their wedding took place on September 8, 1993. They live in Monza, Italy, but are often in Medjugorje, especially during the summer months. Paolo and Marija have four young sons, all whom were given Marija as their middle name: Michele Marija, Francesco Marija, Marco Marija, and Giovanni Marija. It is interesting that Marija ended up marrying an Italian man, as one of the more incredible gifts Our Lady gave to her early in the apparitions was, in an instant, the ability to understand and fluently speak native Italian. She received it in an apparition on her birthday. Marija entered the apparition without being able to speak fluent Italian, Our Lady gave Her the gift of the language, and Marija left the apparition speaking it better than one who has studied to learn to speak it as a language. It is like a native language for her! The Special Blessing helps Our Lady reach hearts that in many ways are unreachable, but through an act of love from one of Her children who is moved to bestow Her blessing upon them, it is enough to open a heart to grace. Marija, in an interview with A Friend of Medjugorje on July 20, 2008, said Our Lady wants the Special Blessing to be used. She wants it to change our mentality that we, as laity, should understand we are to bless others. She wants us to do this through Her Special Blessing. The other two times, also were in the Bedroom, in which Our Lady gave a message saying She was giving Her love.